We love what we do and we want to share our creativity and passion with you! 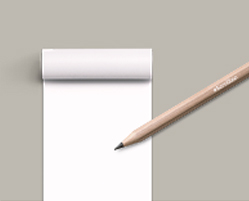 Scroll a little to discover the story behind the invention of Scrollino. We have officially pre-launched the Scrollino in June 2016 during our first Scrollino exhibition at the famous le lieu unique in Nantes, France. 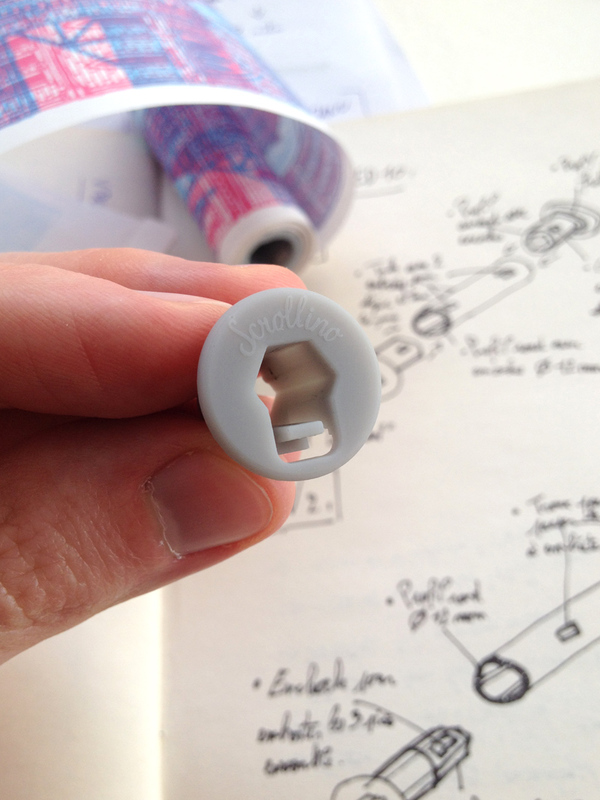 However, the story of the Scrollino’s invention goes back much further. 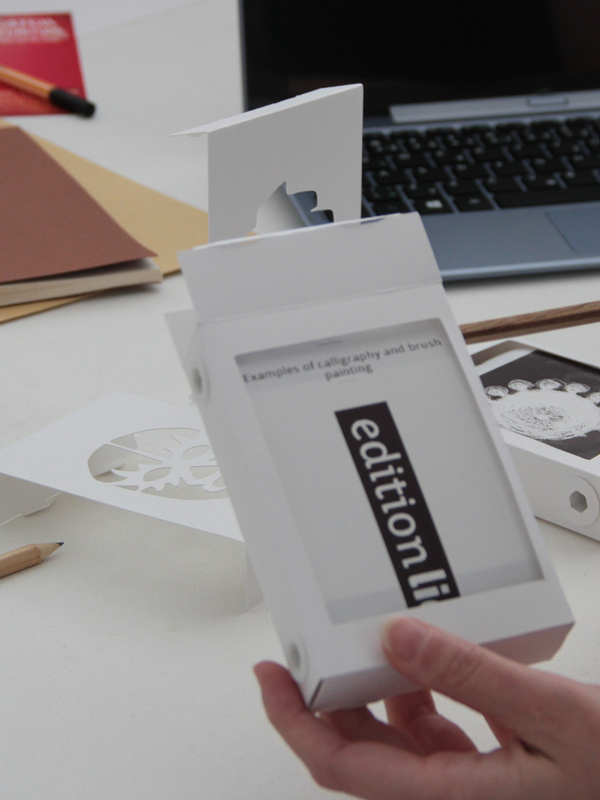 In 2011 we founded Edition Lidu – an independent art publishing platform and started to work with artists and designers all over the world. We always challenged ourselves to bring new interesting ways of reading and we focused on the natural interactivity while organizing exhibitions, workshops and conferences. The Scrollino adventure begins in fact in 2013, when we started to experiment with thermal POS Printers to print and publish illustrated books. The printed results were so nice and exciting. We did not wait too long to develop our own printing software to use the thermal printers usually used in supermarkets. 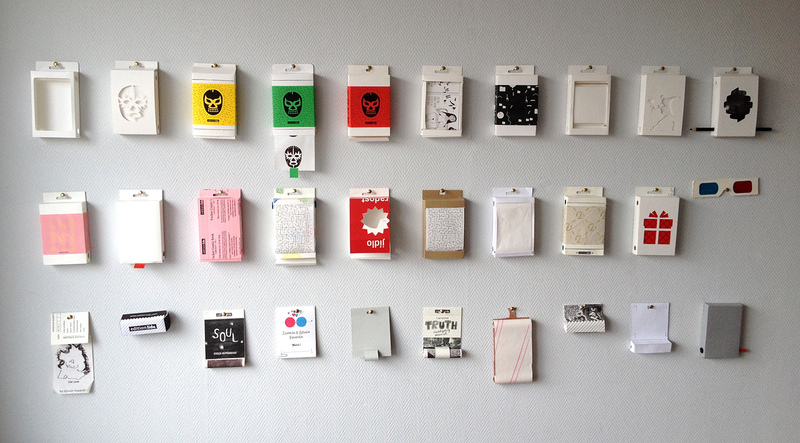 In 2014 we published a collection of Pocket Comic Books (Edition Lidu, 2014), each several yards/meters long. 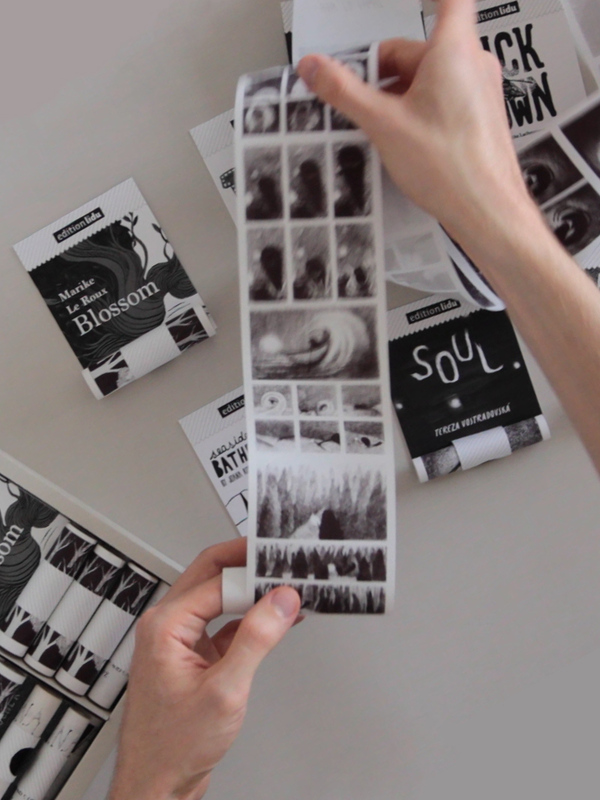 The great feedback from people motivated us to create a better design to unroll and rewind these very long books. After 3 years of experiments, designing and development, Scrollino was finally born in France on March 2016 (still as a prototype). Our first Scrollino presentation in public took place during the art battle Catch d’écriture in Nantes on 12 May 2016. Later on, we have set out for the Scrollino International Launch Tour with the first stop in Brussels in September 2016, and traveled to many places to show the creative possibilities of Scrollino. The international launch took place in Italy for the occasion of the prestigious Milano Design Week 2017. Since then we continue to improve each detail to bring you an exciting experience with Scrollino. Below, we have selected the most important moments of our creative journey, that we would love to share with you. The Scrollino adventure begins in 2013 in Prague, when we started to experiment with thermal POS (point of sales) Printers to print and publish several yards (meters) long comics and illustrated books. We modified the printer and created our own printing software to be able to do so. When we saw the printed result with the illustration on the receipt, we knew, we needed to do something artistic with this technique. The result was so nice, that it pushed us to go forward. As the thermal papers for receipts are delivered in rolls, the idea of printing long comic books presented itself to us. After few months of work, we have released the black and white Pocket Comic Books collection (Edition Lidu, 2014), representing the first books (with images) ever published using the POS printers. We launched our revolutionary concept during the Milano Design Week in Italy (2014). Our special printing software and the fact that thermal POS printers use NO INK to print gave us endless possibilities. 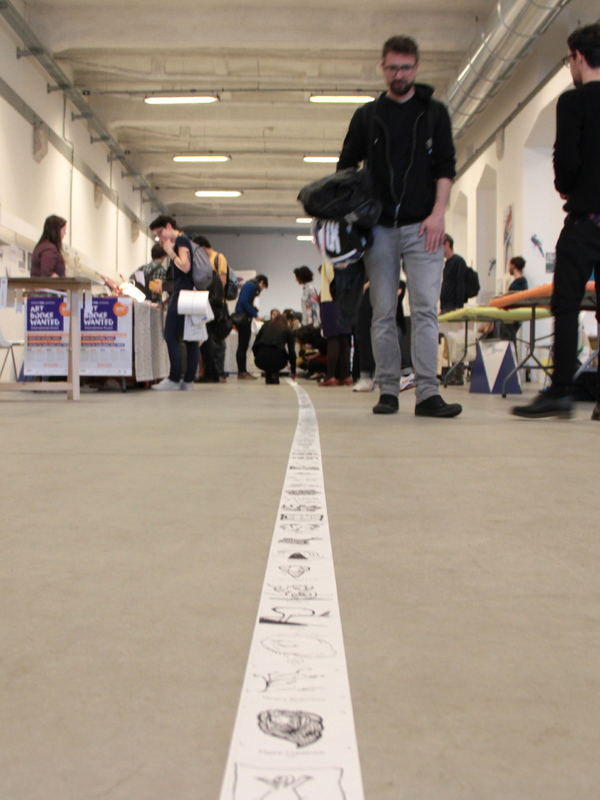 So for the occasion of our exhibition in Milano we organized a workshop and live printing and publishing performance: The World’s Longest Live Printed Book co-created by the visitors of the fair (by that time the book was around 15 meters long). While experimenting with the thermal POS printers, the idea to create and print almost infinite books came quickly into our mind. 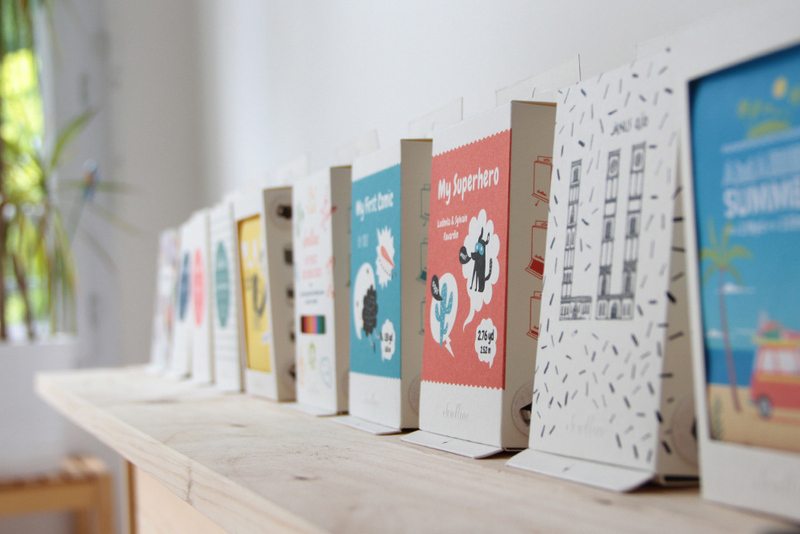 In April 2014 we released our Pocket Comic Books collection and launched our unique concept at one of the world’s most important design event the Milano Design Week (Italy). The collection consisted of 6 comic books published in limited edition of 100 copies of each title. 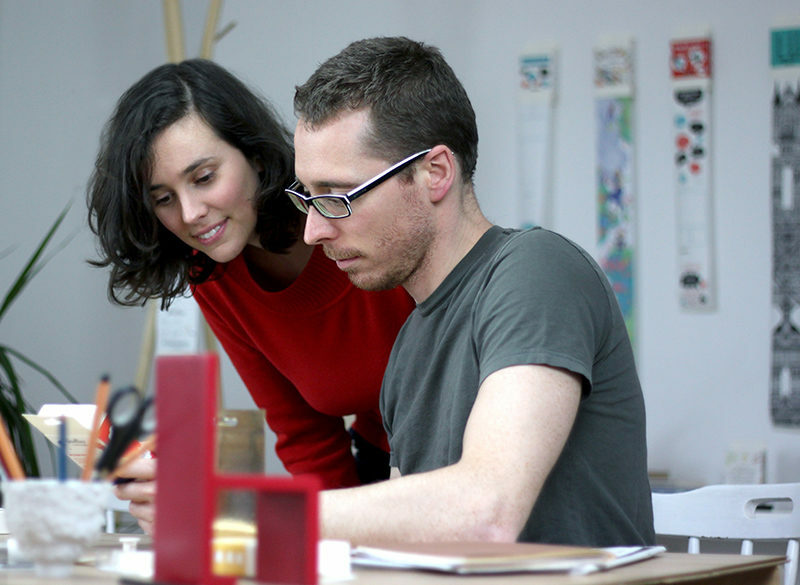 You can read our interview with Ludmila & Sylvain, to find out more about the creation of their own printing devices. Here came one of the biggest challenges – how to rewind these long books in a more user-friendly way. We were playing with the idea to improve the concept and the way how you rewind the books since the very beginning. In the following years, we have presented our concept in book fairs, conferences and workshops around Europe. Encouraged by the feedback from visitors we challenged ourselves to go further. 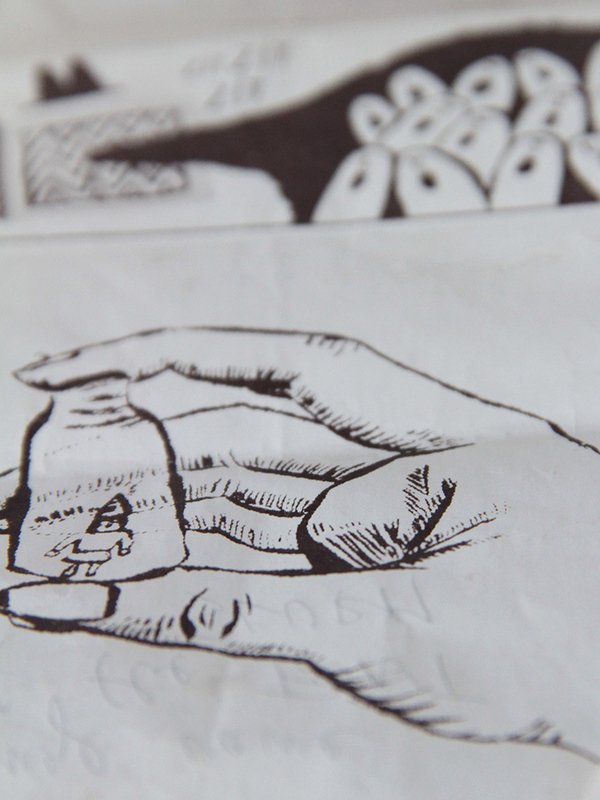 Obviously, the first concept of Pocket Comic Books was innovative and playful, but not user-friendly for everyone. Finding a new design wasn’t so easy, so we kept it aside for some time. At the beginning of 2016, we started with the prototyping of the rewinding system. Main goals: create a beautiful object, use sustainable materials and make it more easy to rewind. At first, we thought of using something already existing to rewind the paper. However, nothing matched our needs. 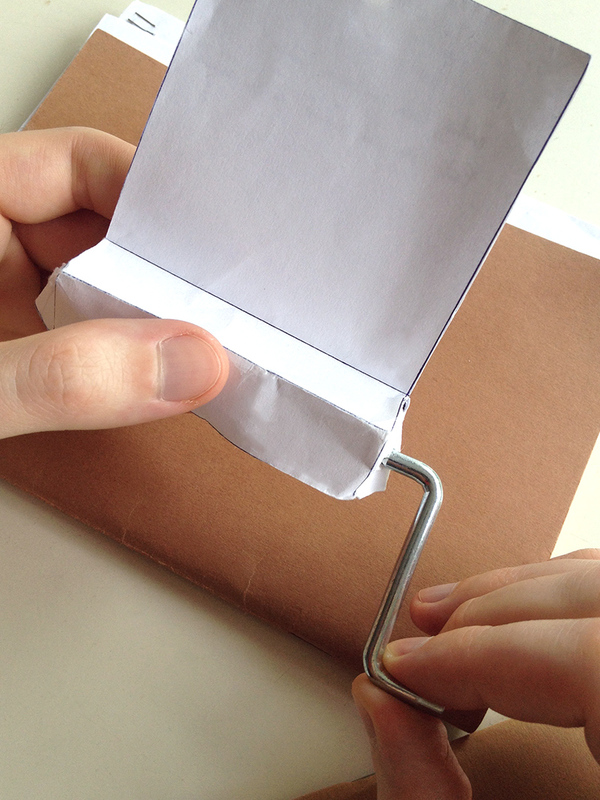 We tried out many ideas, materials, and possibilities that led to the prototype on the photo above. It presented a breakthrough in our research: The rewinding system inside of a solid cardstock box using a simple tool or object to rewind the story. We knew we were very close to finding the right shape for our new book concept. And there the genius idea came to our mind, we will rewind it with a pencil, as it is an object that everybody can find at home and it is a tool that brings ideas to life. 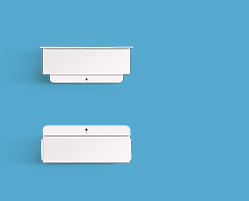 After a very intense designing process, we came up with 2 functional prototypes and 2 concepts: Scrollino® and Double Scrollino® with the Scroller (the rewinding system) made of heavyweight paper. 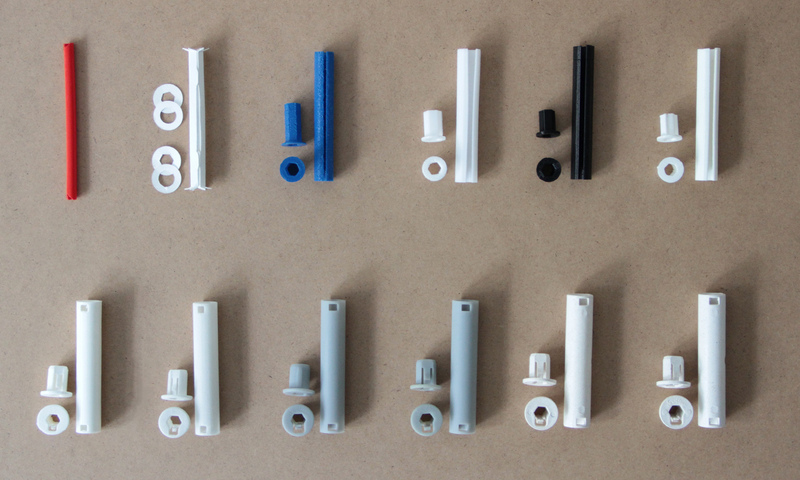 On the photo, you can see some of the many tests and prototypes we created to find the best functional design for Scrollino®. Our first public event introducing Scrollino® took place during the art battle night Catch d’écriture in Nantes on 12 May 2016. Few months ahead we were asked to create a tailored interface, screening and live publishing performance for this event using our thermal POS printing technique and concept. We worked faster than the speed of light to make our new design ready. Only a few days before the event we finally came up with the name for our invention and registered the word Scrollino as an international trademark to make it official. The Scroller is the unique specially designed rewinding system that makes the Scrollino alive. 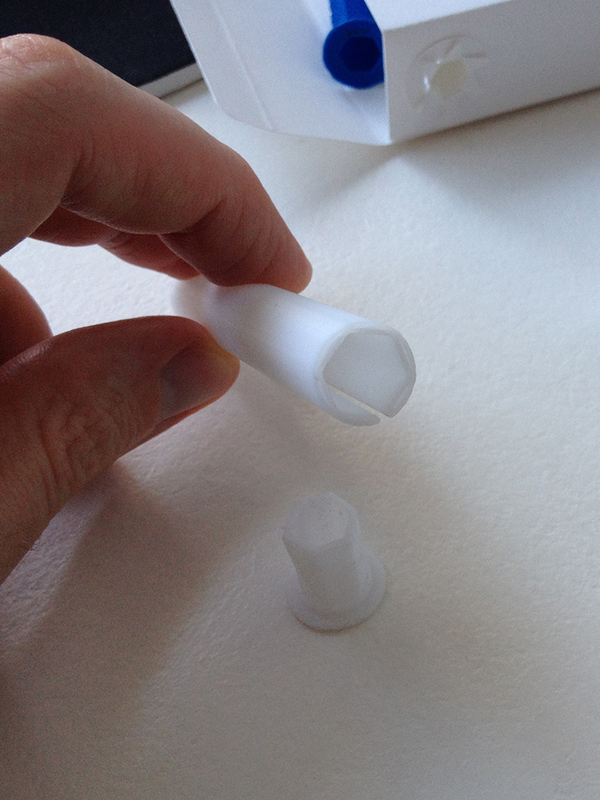 Each Scroller consists of 1 tube and 2 caps with very precise measurements to achieve a smooth paper scrolling and a unique reading experience. To find the right shape and functionality of the Scroller was the most challenging part of our designing process. Now it looks like it existed for ages, it works so well, so you may not realize that it actually was a long run to conceive it and to produce it in the shape you know now. You may wonder, why it was so difficult to make it happen? First of all, we only wanted to use eco-friendly but solid materials to produce the Scroller. We kept in mind that sustainable solution will be more expensive and harder to find in Europe (where we are actually based) but to act responsibly towards our environment was and still is one of our primary goals. 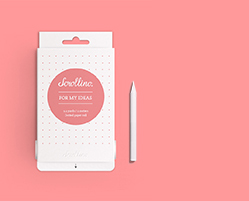 We thought it would be a great idea if it is compatible with most pencils and pen profiles and also that it could be easily refillable with blank papers to write on for example. You see? At first it seemed like many nice ideas that are not so easy to combine in the real life. But we kept digging. To find the right shape and functionality of the Scroller was the most challenging part of our designing process. From the beginning, we set the goals pretty high: It must be produced from sustainable materials (ideally from recycled materials) and of course, it must turn smoothly and it should feel like magic when you interact with it. At first, we designed the Scroller to be entirely made of heavyweight paper, using our small cutting machine to produce the Scrollino® Box and the paper Scroller. These Scrollers worked, however, they were not solid enough and were very complicated to assemble by hand. The next step was to redesign the Scroller using a 3D printer. The material used was the PLA which is a biodegradable thermoplastic, made from renewable resources like corn starch or sugarcane, however after hundreds of tests, we were still not convinced by the results. The shape of the Scrollers was not precise enough, so the pencil did not fit every time, and it took ages to produce just dozens of them. The previous tests on 3D printers helped us resolve many technical problems so we could redesign the final shapes and improve the functionality of the Scrollers. 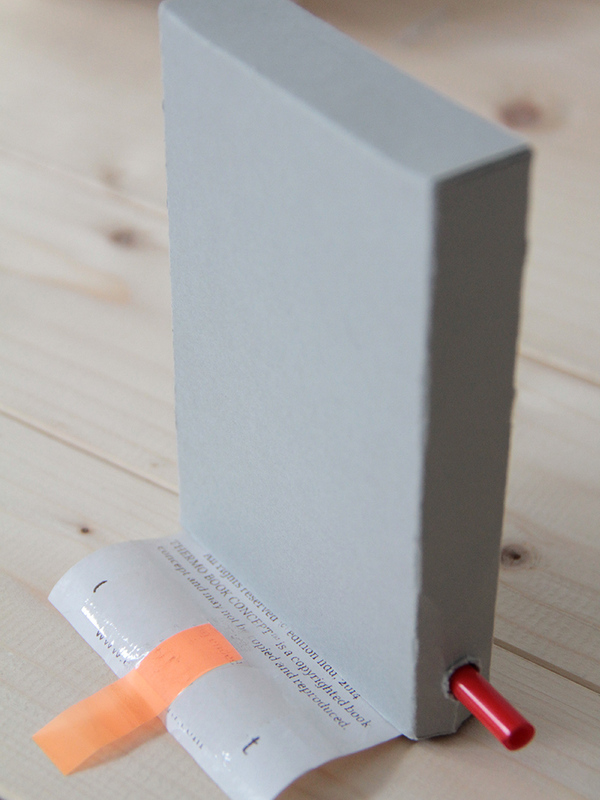 The prototype on the photo presents the final version of the Scroller, compatible with most pencils and pens and offering the possibility of refilling the Scrollino by a new paper roll. as the Scrollers are fully degradable in nature (compostable). Nowadays, our Scrollers are molded in France. In the mid-2016 we were in the process of designing the scrollers and resolving thousands of challenging technical questions that Scrollino® brought on the table. And right in the middle of these moments, we’ve got the opportunity to present an exhibition at a famous and highly visited art space Le Lieu Unique in Nantes, France. 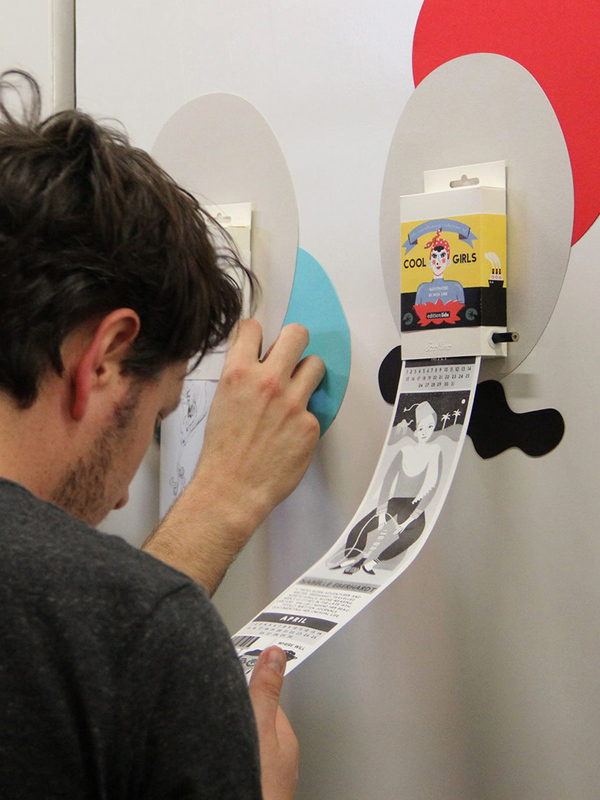 Well, we took the challenge and curated, designed and organized the first Scrollino exhibition asking over 30 artists to create stories, comics or illustrations using our new art medium and the possibilities of the thermal POS printing technique. The Opening night was a great delight, everybody was excited about Scrollino, so we knew we are on the right track. The exhibition at the Le Lieu Unique (France) showcased over 30 artists and their works created especially for our new Scrollino® concept. For this special occasion, we have prepared full accompanying programme, with a guided tour, artists meetings, and workshops. During the month of the exhibition we received a fantastic feedback from the visitors both the general public and professionals, we were encouraged to continue working to bring Scrollino to perfection. How do we print so long of a story in the Scrollino? The answer is naturally: with Scrollinography™. However, it was not possible until we invented it. As you may have discovered above, we first started to experiment with thermal POS Printers (point of sales) to print and publish several yards (meters) long illustrated books in black and white. Our first Scrollino were printed on thermal papers using this technique via our own printing software. 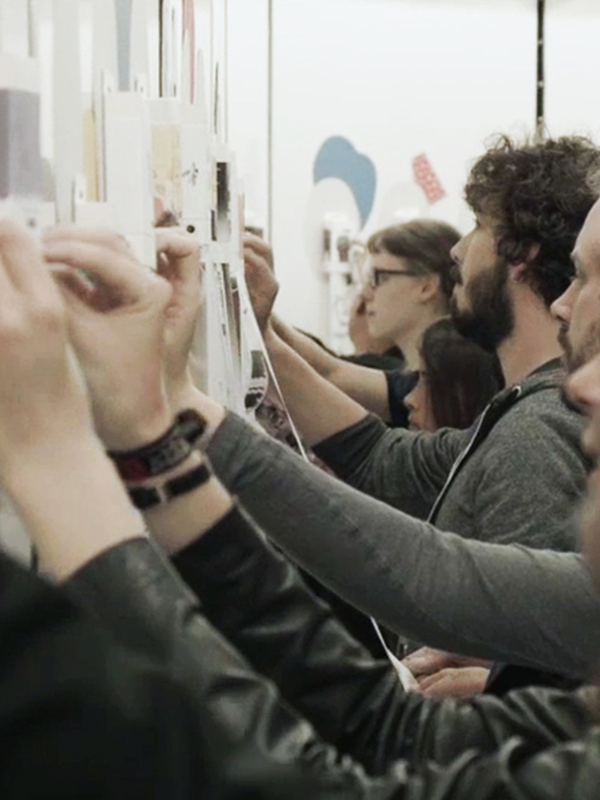 After our pre-launch Scrollino® exhibition, we fully understood the creative potential of our media. We decided to go even further: to give the artists and the readers also a colorful experience and to achieve printing of continuous images (illustrations and texts) without any visible interruptions (blank space). We realized, the technology does not exist and no printing house in the world would be able to produce it in the quality we needed. With our unique printing technique Scrollinography™ we can print uninterrupted endless color images. Scrollinography™ is a unique printing technique developed by Ludmila & Sylvain Favardin in order to print uninterrupted endless images in black and white or even in color. 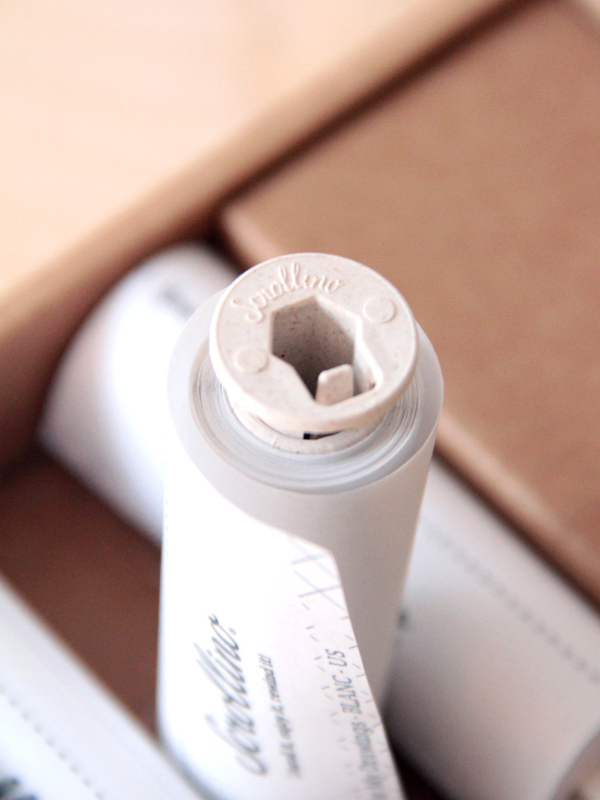 Our technique enables us to print from 1 to many copies of stories or whatever we wish to try out on our custom made paper rolls. Any length is possible, so we can even print miles (km) of stories. Until June 2016 Scrollino® paper rolls were only available in black and white (inside content, the covers were in color) as no color technique existed. We started to develop our new technique in July by combining existing machines and printing techniques with our own printing driver and software. 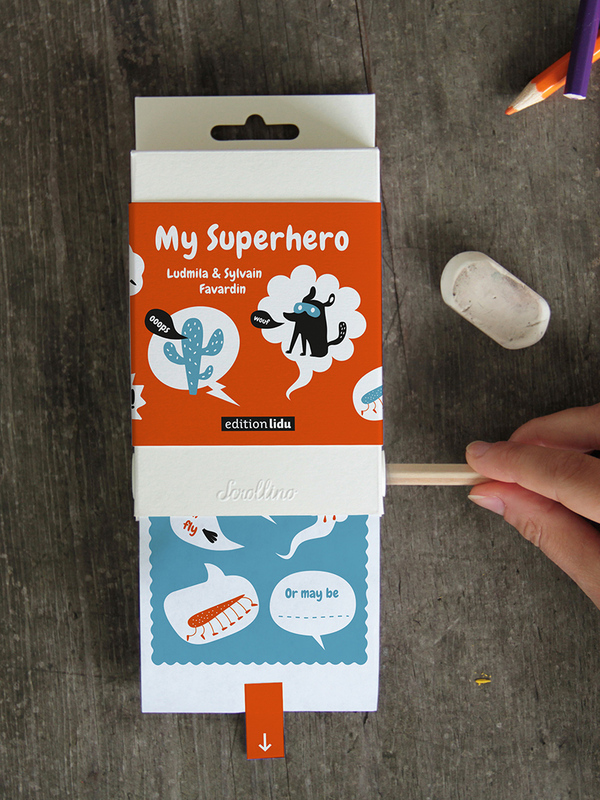 Our first Scrollino® printed in color was the activity Scrollino My Superhero published on the occasion of the Comic Strip Festival in September 2016. During the festival, we also presented our editorial concept and printing technique during the festival’s conference. 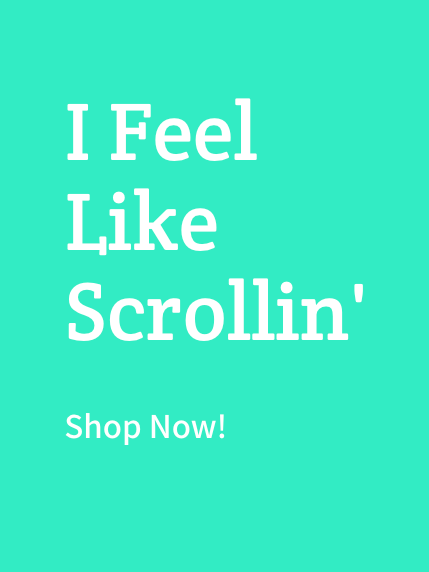 You can find a new edition of this Scrollino in our Online Shop. On January 27, 2017 we showed off the Scrollinography printing in a live public event for the first time. 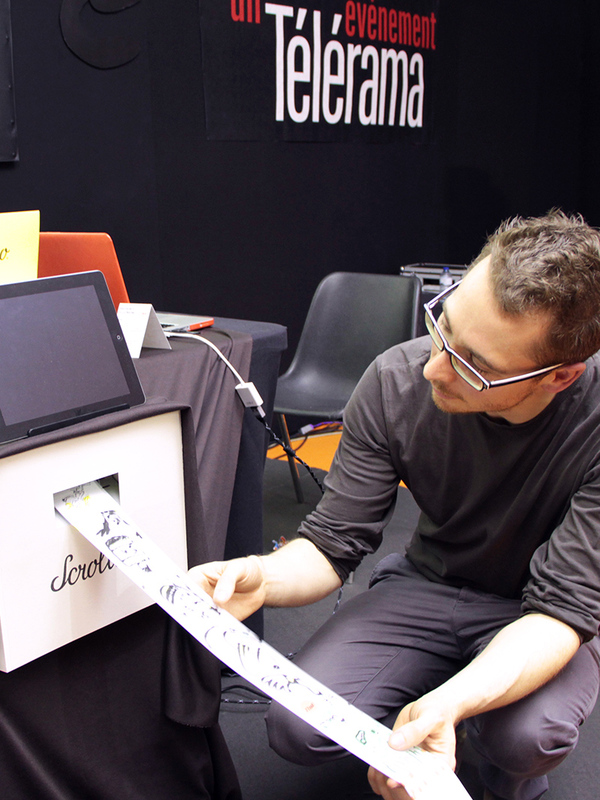 It was during our Scrollino Battle – an encounter between the Scrollino, the new book concept and a graphic art improvisation, organized on the occasion of the International Comics Festival Angouleme (FIBD) 2017, one of the biggest comics festival in the world. Our official French launch at the International Comics Festival Angouleme (FIBD) in January 2017 was followed by a world launch at the Milano Design Week in April 2017. We were blessed enough to present Scrollino in the very prestigious Zona Tortona design district – a place where designers, art directors, curators, company owners and the general public come to discover the most innovative projects that will remarkably influence the world of design. To constantly improve ourselves to bring you not only a great product but a unique experience is our passion. We designed every aspect of the production process and the Scrollino® itself to be independent in the production. Nowadays, we use our own technology that allows us to print and produce any desired number of copies, starting from 1 copy which makes Scrollino® a perfectly customizable product. It is great for improving our new collections before printing many copies. All our Scrollino® are carefully crafted in our studio in Nantes, France. 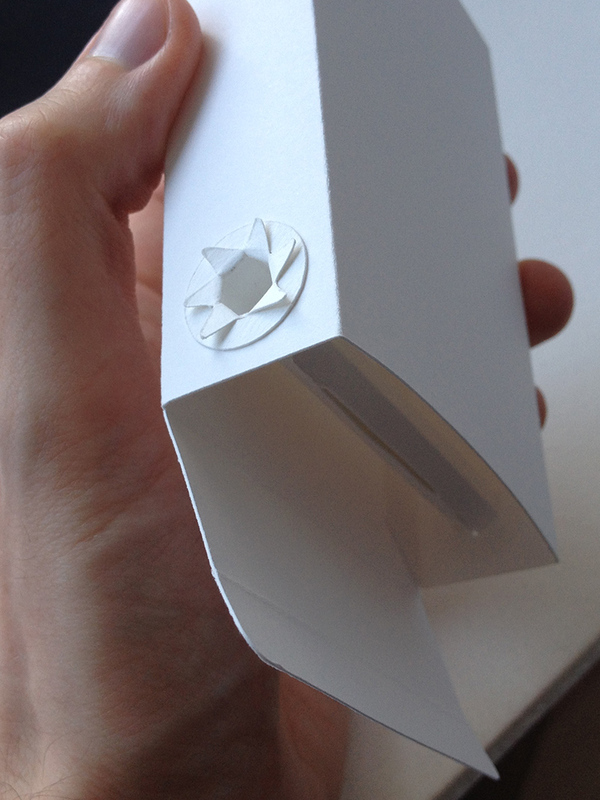 The human touch is infused in each fold of the box, in the assembly of the Scroller, in the embossing on the cover. We use high-quality sustainable materials. Our paper and cardboard are produced by FSC certified manufacturers. The Scrollers are made of recycled liquid wood. We use our own full-color printing technique Scrollinography™ and die cutting machine, so the possibilities are just as endless as the Scrollino® itself! 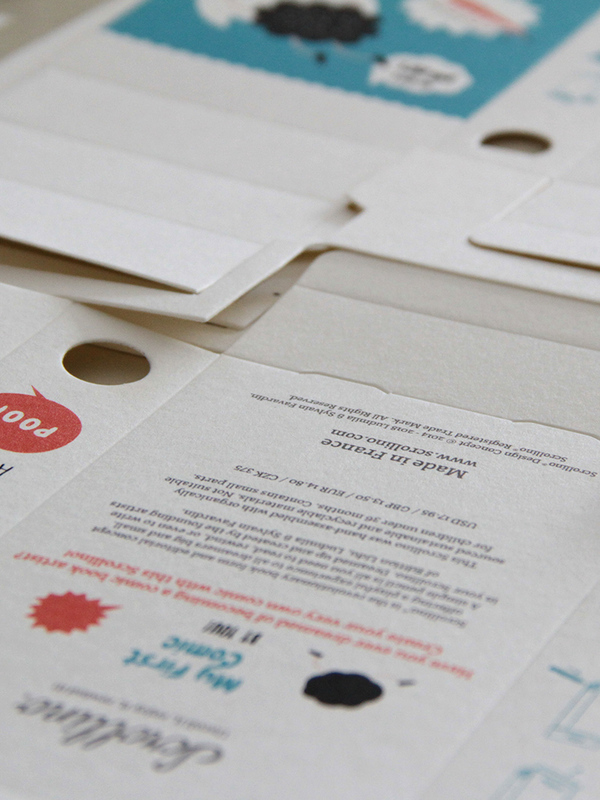 You can communicate your brand, pack small products or samples, create elegant brand stationery and offer unique corporate gifts. If you are interested in this side of Scrollino®, please read more here. In 2016 we re-invented the printing method and selected the best papers to print on. We baptized our new technique Scrollinography™. This technique allows us to print uninterrupted endless images, stories or games in color. Plus, the pigment we use is non-toxic and environmentally-friendly. Read more about the materials & sustainability. We take a lot of joy to come with new ideas for Scrollino®. We use Scrollino in many creative ways, so each of Scrollino offers a little bit different experience. 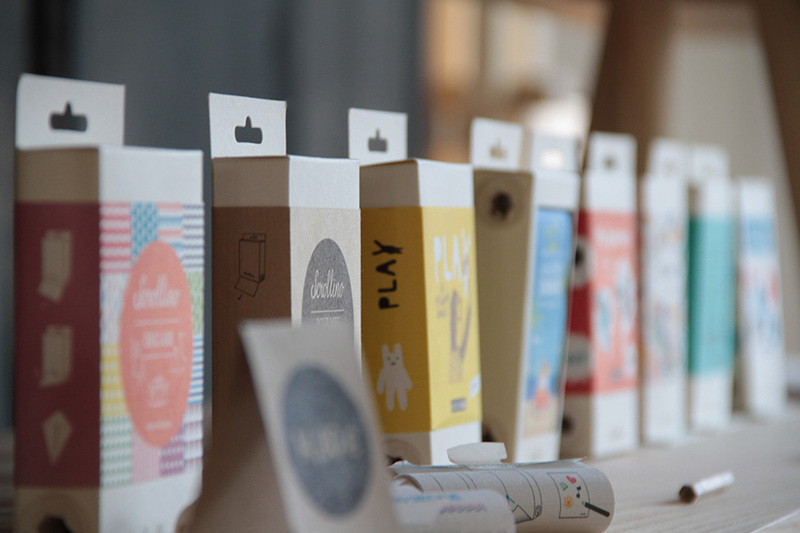 Are you searching for original stationery, inspiring stories, fun activities or games? Scrollino can offer it all. 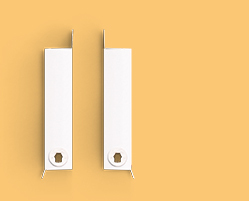 Please visit our Online Shop to discover individual Scrollino in more detail. 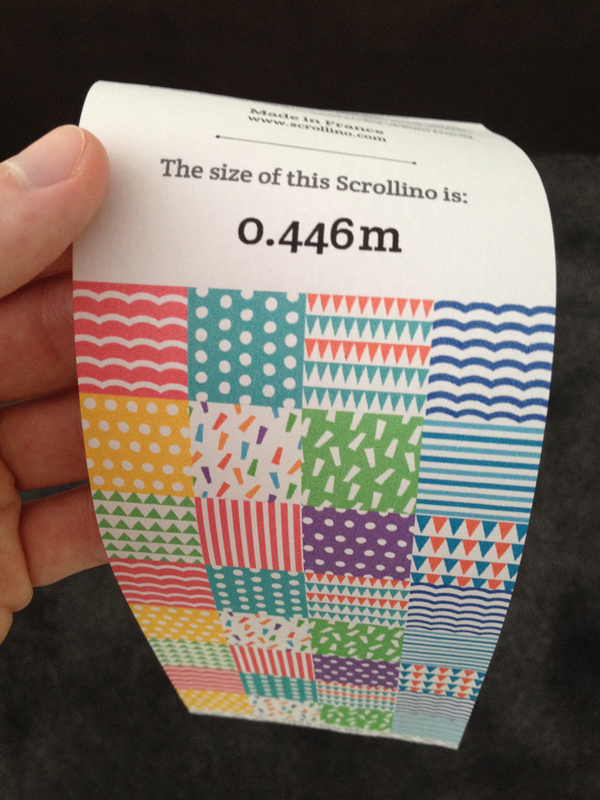 Unroll the magic of Scrollino by trying it for yourself.